Women make up 51% of the American population, yet still aren’t treated equally to men in areas that matter most. In this provocative new book, Lis Wiehl, one of the country’s top federal prosecutors, reveals the legal and social inequalities women must face in their daily lives–and provides a “Tool Box” for dealing with a variety of issues. From boardroom to courtroom, from pregnancy to contraception, from unequal pay to domestic violence, women are more often than not handed the short end of the stick. • A woman earns seventy-three cents for every dollar a man makes. • Domestic violence remains the single biggest threat of injury to women in America. • The federal government continues to increase funding for abstinence-only education, even though it’s proven to put our daughters at greater risk for unwanted pregnancies and sexually transmitted diseases. • Health insurance plans are more likely to cover Viagra prescriptions than birth control pills. Why are powerful women viewed with consternation while powerful men instill respect? Why is it that for every ten men in an executive, decision-making role in this country, there is only one woman in that same role? Why do our federal courts continue to be stacked with male judges even though women receive more than half of all law degrees? And why shouldn’t a woman be president? Enough! 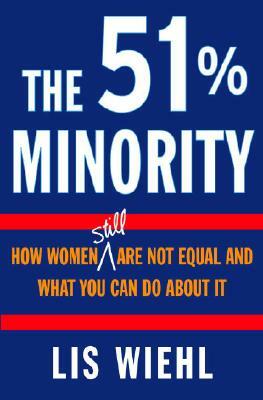 Women are not equal in our society or under our laws and the remedy is quite simple: Besides being the majority of the population, we also control the economy, spending 80 percent of every discretionary dollar, and given that 54 percent of voters are female, we can swing an election. With our numbers we can do something about it. This is a critical moment: We can either take the road toward equality or allow ourselves to be driven further away from fair treatment. The 51% Minority is a clarion call to the silent majority to take a stand . . . before it’s too late.